One of the best places to gain inspiration is from TV and movies. In today’s tutorial, the image I will be walking you through was highly influenced by anime, more specifically Studio Ghibli movies such as Spirited Away or My Neighbor Totoro. We will be using adjustment layers to get a vivid but calming color grade, and you’ll also learn how to extract fur and how to create a bright, colorful haze. To start everything off, we will be placing in our landscape base image. 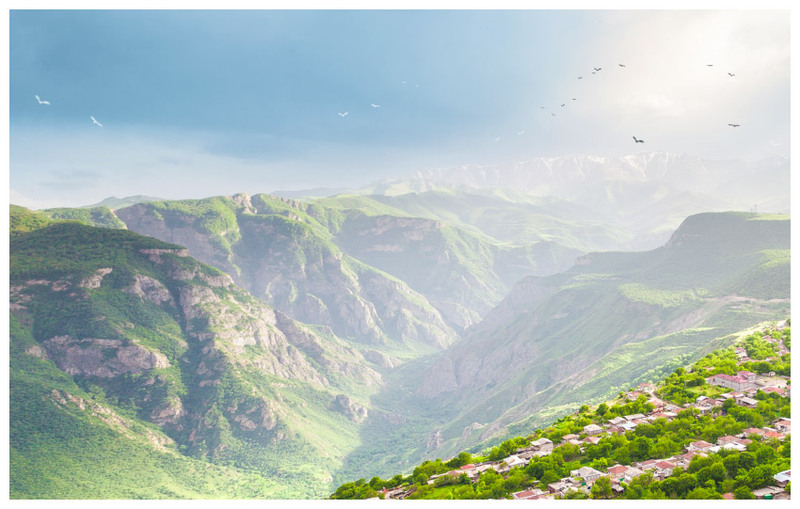 When it comes to landscape stock images, it’s often the case that the original image itself is already breathtaking and only needs a few small enhancements! Be careful of overprocessing images! Place and position the landscape so that it’s slightly tilted. Create a new Pixel Layer. Set the layer mode to Color. With a very large, soft, round Paint Brush, paint a light blur across the sky. 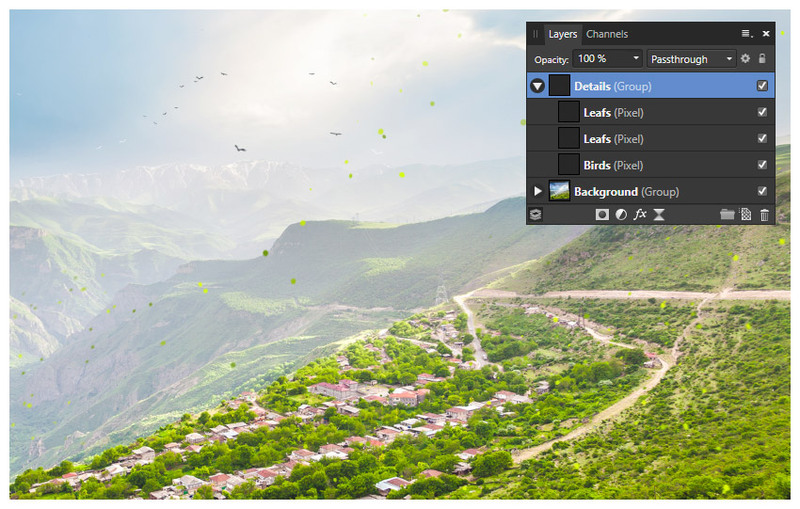 Create a Brightness/Contrast adjustment layer above all current layers. Group three of the background layers into a new group named “Background”. Next up, we will be adding a few small details. While these details might not seem significant, it’s things like this that add atmosphere to your piece! Never skimp on the detail! Create a new Pixel Layer. Set the Opacity to 70%. With a very small, hard, round Paint Brush, paint birds in the far-off sky. Paint black birds where there is white sky and white birds where there is blue. When drawing a bird that’s so far off in the distance, there isn’t really much point in sweating the details. I like to just draw two messy lines and a dot. Once you draw one or two, you can copy and paste them all over in various sizes. There are also premade “flying bird silhouette” brushes you can find all over the web. 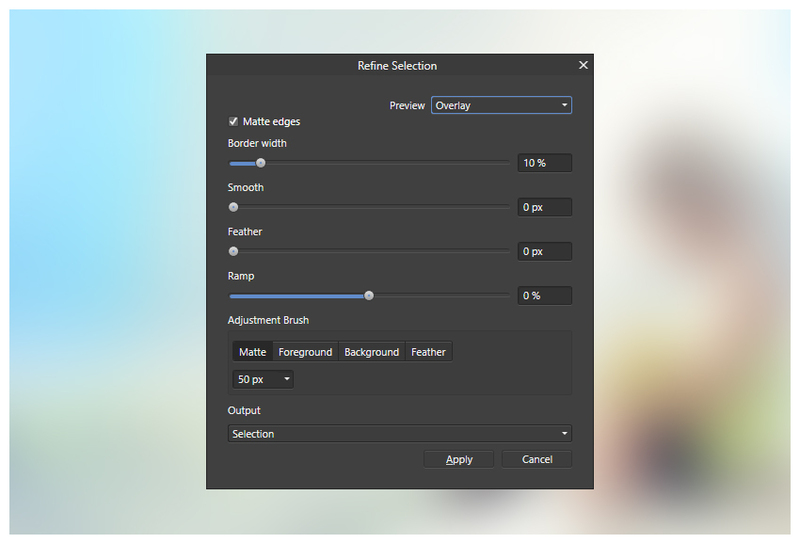 Remember, Adobe Photoshop brushes are compatible with Affinity Photo! With a small, hard, round Paint Brush, paint small bits of leaves, debris, and dots in the wind to give the image a sense of movement. Use various shades of green. Group all of the leaf and bird layers together into a new group named “Details”. There are several different ways to extract fur, and while some techniques work better than others, it really depends on the overall style you are going for. The technique we will be using today works best on stylistic pieces, as opposed to hyper-realistic pieces. Place and position our giant panda onto the right side of the canvas. 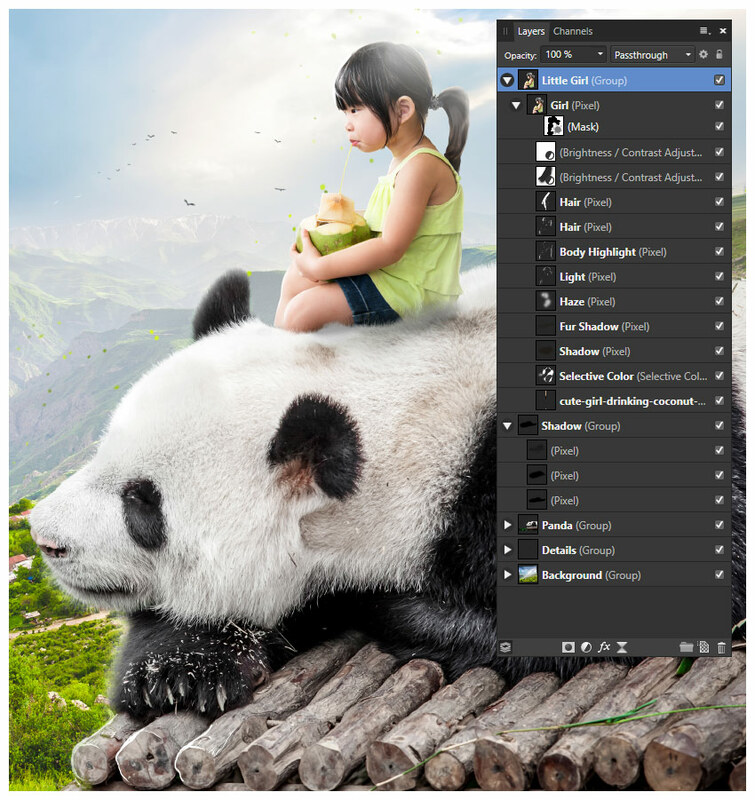 Using the Selection Brush Tool, make a rough selection around the panda. Hit Control-Shift-I to invert and reverse the selection if needed. Depending on how you did the selection, you may not have to. Hit the Refine button located to the right of the selection toolbar. 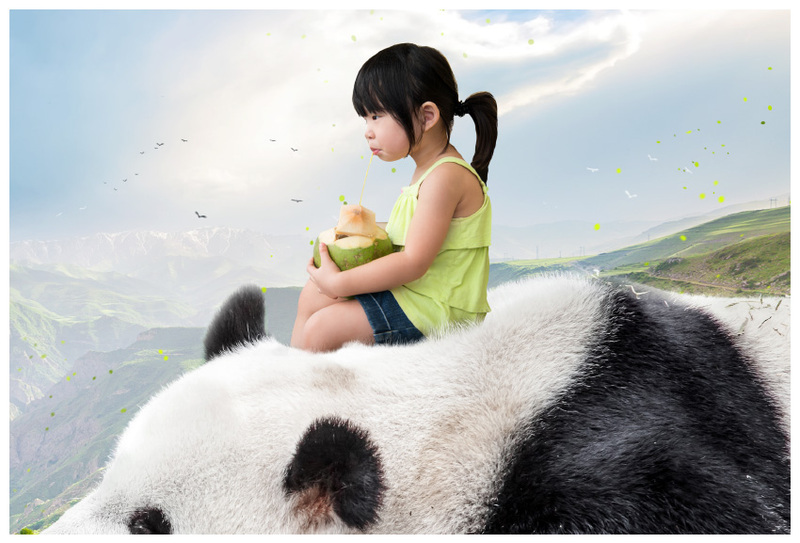 Run the Refine Edge Brush across the edge of the panda’s fur. 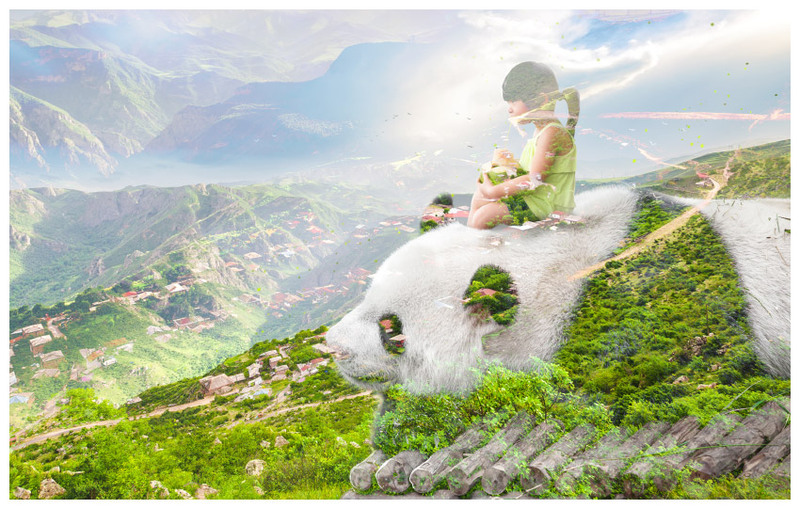 Hit Apply and then add a Layer Mask to the panda to mask out the selected area. With a semi-soft round brush, mask out any leftover background. Use the Clone Brush Tool to clean up all of the grass and straw on the panda’s black fur. 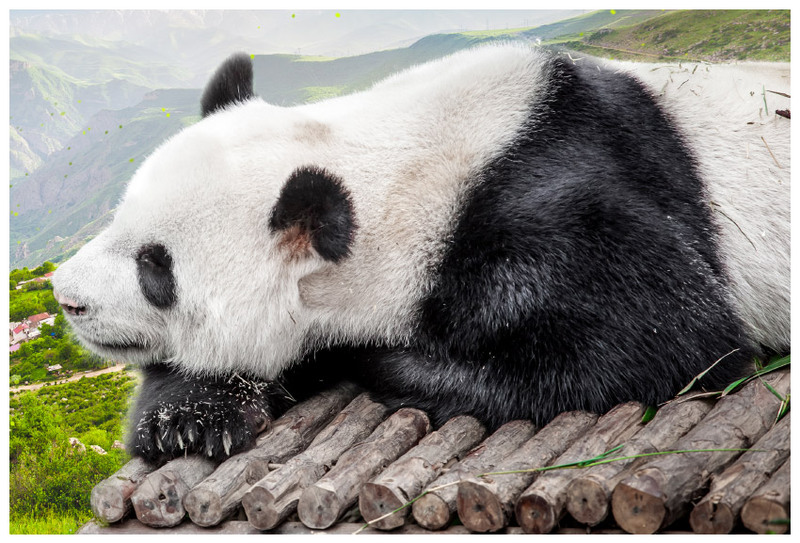 Nest a new Pixel Layer into the giant panda. 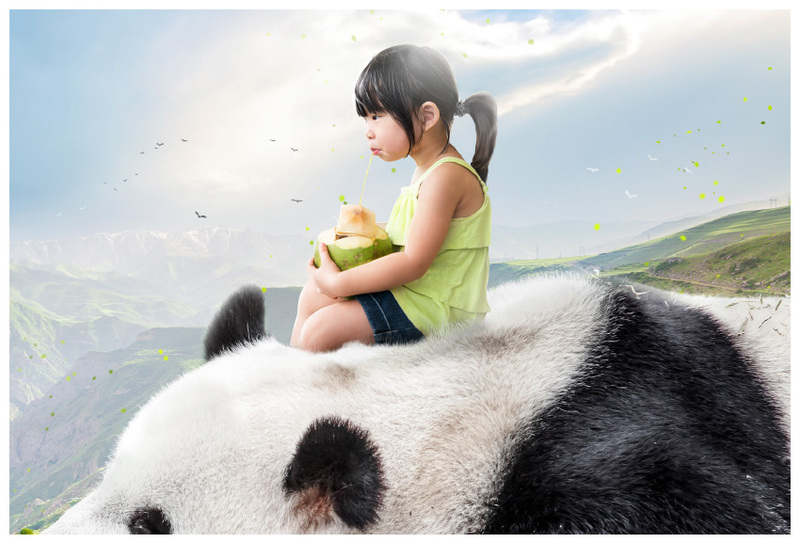 Use a large, soft, round Paint Brush to paint white around the edges of the panda, filling in the hair. Nest another new Pixel Layer into the giant panda. Use a medium, soft, round Paint Brush to paint white on the highlights of the panda to intensify them. To build up more intense light, you can paint on multiple different layers—I use two. You can also lower the layer’s Opacity if the highlight is too strong. 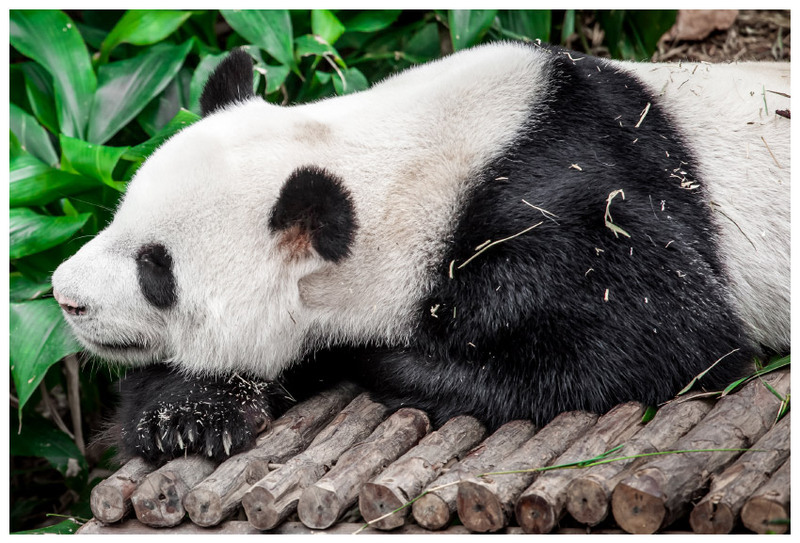 Use a small, round Paint Brush to paint harsh white highlights on the edges of the wood that our panda is lying on. 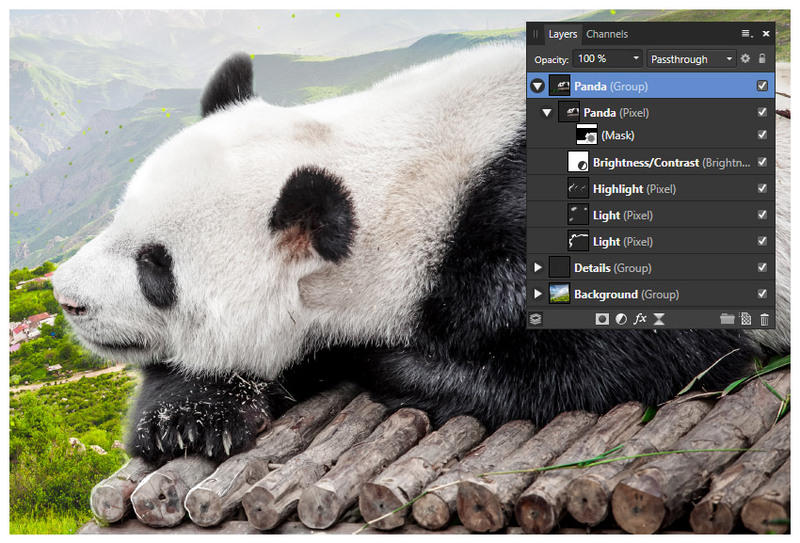 Create and nest a Brightness/Contrast adjustment layer into our panda. Group all of the panda layers together into a group named “Panda”. Next, we will be adding a little girl to our panda’s back! When placing a subject onto a new surface, you have to keep in mind both the shape and texture of that area. For instance, when sitting on fur, there would be strands of hair rubbing up against the subject’s legs and lower body. Keeping things like this in mind will help keep your subject from looking as if they are floating! Place and size the little girl onto the panda’s back. Extract the subject using your preferred method. I suggest either the Pen Tool or the Selection Brush Tool. You will have to create a new edge, as part of the subject’s back is cut off in the original stock image! Use a very small, hard, round Paint Brush to mask out fur-like shapes on the bottom of the little girl’s body. Create and nest a Selective Color adjustment layer into our subject. Set the layer mode to Color. Mask out everything but the little girl’s t-shirt, to really make the color of her shirt pop. Create and nest a new Pixel Layer into the “girl” layer. Bring the Opacity to 42% and the layer mode to Multiply. 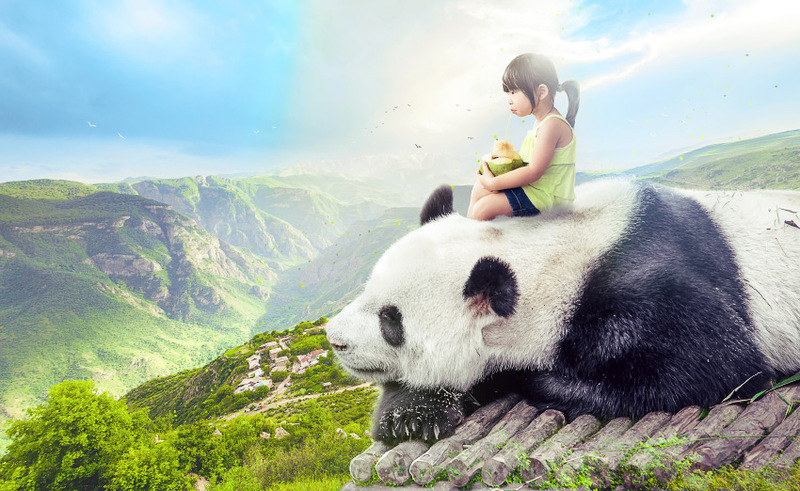 Using a medium, soft, round Paint Brush, apply dark brown shadows on the lower portion of the little girl, focusing on where her body and the panda meet. Repeat step 3, only this time paint small hair-like shadows similar to the hair strokes you painted in step 1. 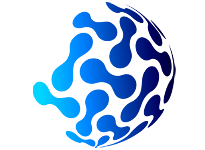 Create and nest a new Pixel Layer within the panda layer. Set the Opacity to 70%. With a large, soft, round Paint Brush, paint a white haze of light onto the little girl’s head and back. 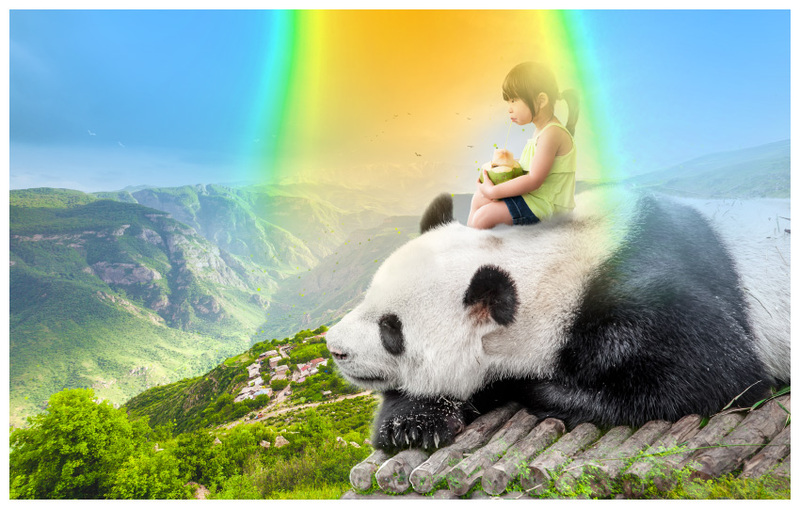 Create and nest a new Pixel Layer within the panda layer. Set the Opacity to 35%. With a medium, soft, round Paint Brush, paint the soft white highlights of the subject’s hair and neck.  Create and nest a new Pixel Layer within the panda layer. Set the Opacity to 75%. Using a small, hard, round Paint Brush, paint white highlights onto the body of the subject. You can go onto the hair a bit, but focus on the body first. With the same brush as above, paint hair-strand highlights on the front of the subject’s head, and paint softer hair strands and highlights towards the back. Use the Eraser Brush Tool to get rid of any harsh edges. 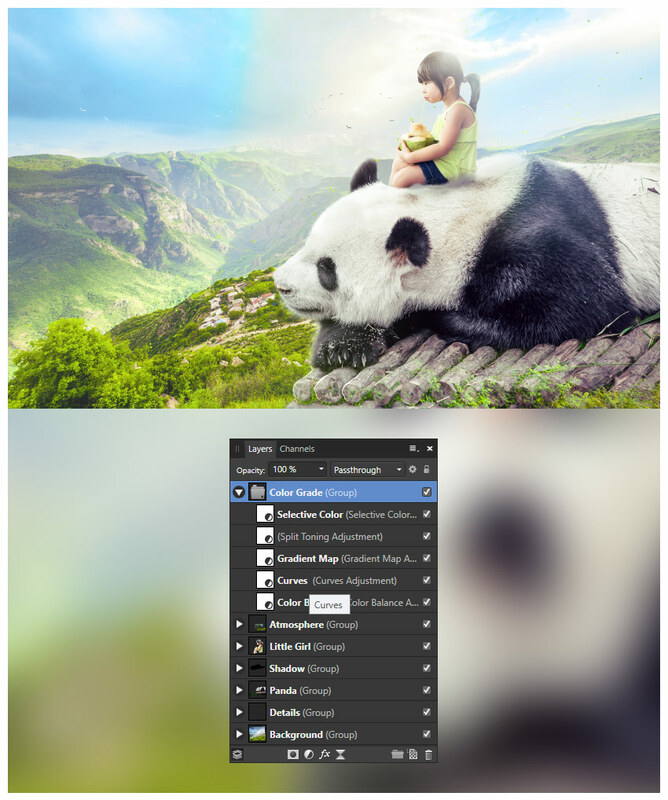 Create and nest a Brightness/Contrast adjustment layer into the panda. Mask out the front portion of the subject using a large, soft, black Paint Brush to create a shadow on the back of the little girl. 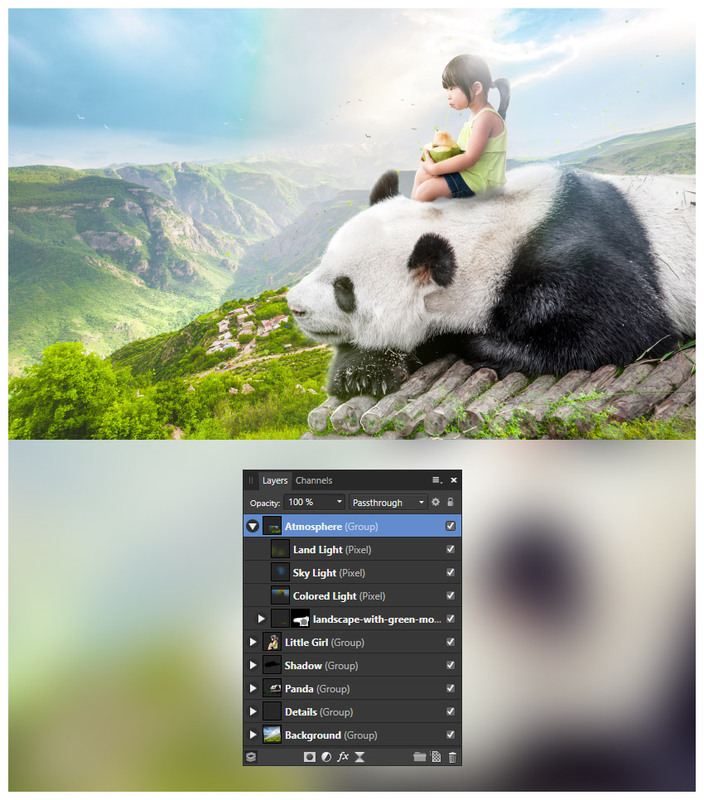 Create and nest a second Brightness/Contrast adjustment layer into the panda. Group all of the subject layers together into their own group, naming it “Little Girl”. Next, we will be adding some basic shadows under our subject. Create a new Pixel Layer below the “Little Girl” group. Set the layer to Soft Light. Using a medium, semi-soft, round Paint Brush, apply dark brown underneath the subject to create a subtle shadow. Try not to make it too blob-like or soft; shadows have shape! Repeat step 11 to further darken and intensify the shadow. Repeat step 11 one more time, only this time set the layer to Normal at 33% Opacity. Remember to give shape and structure to the shadows! Group all of the shadow layers into a group and name the group “Shadow”. Next, we will be adding more light and color to our sky using a few simple layers set to screen. I always like to save this part for the end, when I know all my other main elements are completed and won’t be moved around too drastically! First, let’s add some greenery to the platform that our subjects are sitting on, and then we will move on to adding some atmospheric haze. Duplicate the landscape stock layer we used for our background. Bring the duplicate above all previous layers. Set the duplicate landscape to Lighten. Enlarge the duplicate significantly, placing it so there is a substantial amount of leaves and green in the bottom-right corner of our canvas. 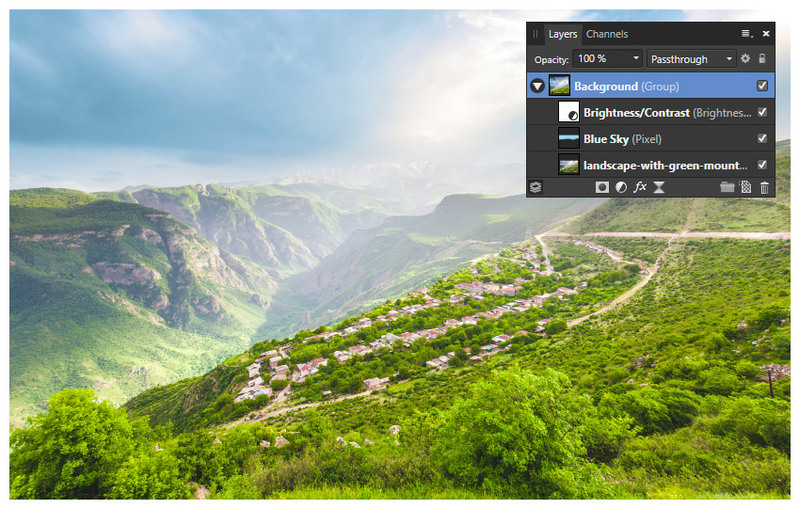 Add a Layer Mask to the duplicate landscape layer. Mask out everything but the lower right-hand corner. Create a new Pixel Layer above all previous layers. Set the layer to Screen, and 60% Opacity. Paint a mixture of light blue, green, yellow and orange to create a rainbow-like haze on the top half of the canvas. Below is my layer at 100% Opacity set to Normal just so you can better see how and where I painted. 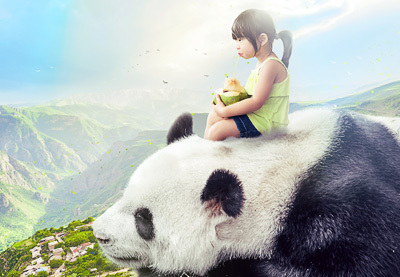 Using the same brush as above, paint more light blue over the back of the little girl, bringing the light slightly down onto the panda’s back. Repeat step 5, but this time use a vivid green over the bottom half of the canvas. Group all four layers you just created into a group named “Atmosphere”. Finally, to bring all of our elements together and give everything one final uniform look, we will be applying a vivid but calming color grade effect. I love saving this step for last as it really gives everything one last nudge of color and contrast! We will be using a total of five layer adjustments, ordered from last to first. 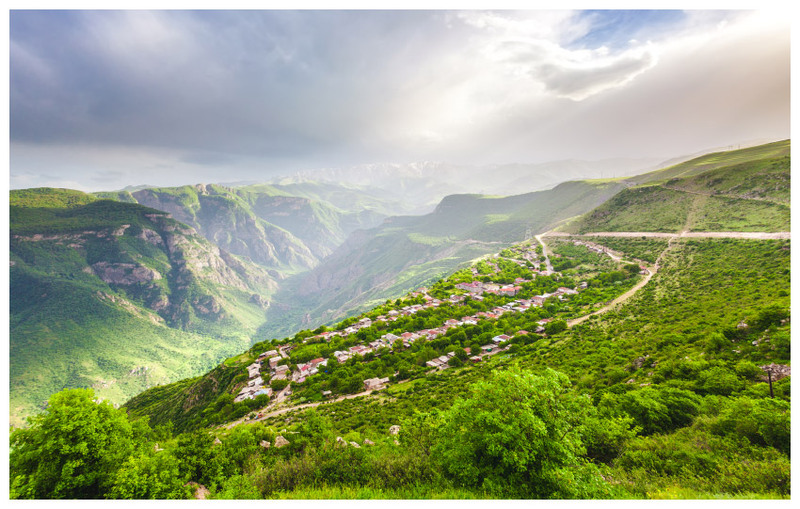 Create a Color Balance adjustment layer above all current layers. 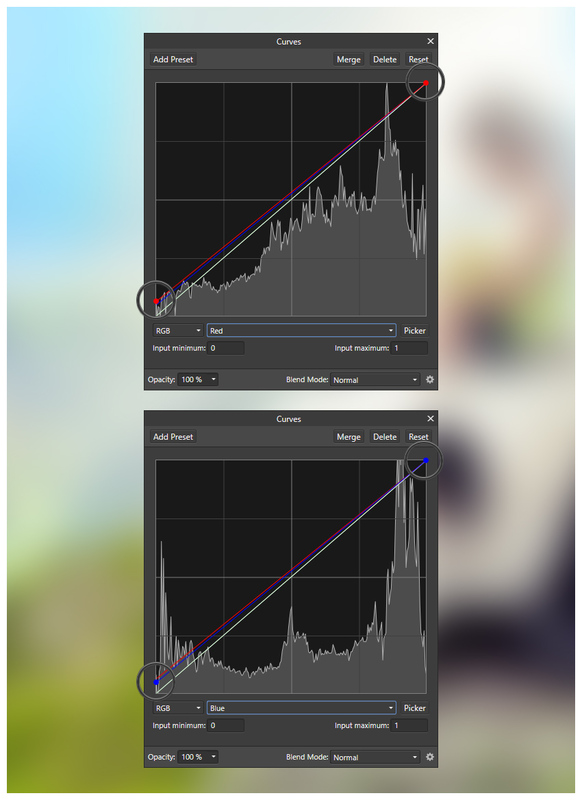 Create a Curves adjustment layer above the “Color Balance” layer. Create a Gradient Map adjustment layer above the “Curves” layer. Create a Split Toning adjustment layer above the “Gradient Map” layer. Create a Selective Color adjustment layer above the “Split Toning” layer. Group all five adjustment layers together into a group and name it “Color Grade”. Paying attention to the small details—like how fur rubs up against the skin, or how small leaves and seeds are often found floating in the background of animated films—allows you to incorporate them in your work and bring life and atmosphere to your piece! As with everything, the more you practice, the better you become—not only at seeing these details, but also at creating them yourself! So, as always, keep experimenting with different techniques, and don’t forget to post your version below, along with any questions, comments, or critiques!